This show was broadcast June 8, 2010. Karta: Jews United Against Zionism. Flash: Splitting the Sky sorta wins at his trial!! 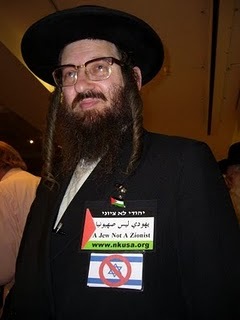 Guest: Rabbi Yisroel Dovid Weiss of Naturei Karta: Jews United Against Zionism. Rabbi Weiss was in Turkey during preparations for the latest Free Gaza flotilla and had a place reserved for him on the Mavi Marmara, but was warned not to go due to reports he might be on an Israeli hit list. 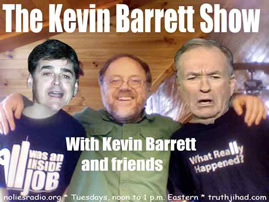 Thankfully he survives to fight another day…and to join me on the Kevin Barrett show! Rabbi Weiss is a good, G-dfearing man who has taken on a terrible burden by standing in the front lines against Zionism and the murderous, idolatrous fanaticism it represents. Still his heart is light and joyful, and his earnest, excited voice betrays the merry twinkle in his eye. This is a man who knows he is acting honorably in the sight of G-d…a man with a message that the world may finally be ready to hear. We also get an update on the Splitting the Sky trial just concluded in Canada, where he sorta wins. Remember he was on trial for attempting to arrest former President George Bush. The judge let him off with no criminal record and having only to make a donation to a charity. He will be making a thousand dollar donation to Architects and Engineers for 911 Truth. How about that for poetic justice!! This entry was posted on Tuesday, June 8th, 2010 at 11:19 am	and is filed under Anti-War, Death Squads, Freedom, Justice, Kevin Barrett, News, Occupation, Protest, War Crimes. You can follow any responses to this entry through the RSS 2.0 feed.